Unrivaled Perfection - for baking, snacking and gift giving! Pecans are as natural to Texas as sunshine. 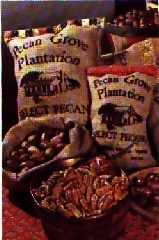 And here at Pecan Grove Plantation we take special pride in growing the most plump and delicious pecans under that Texas sun! Our 10,000-tree orchard enjoys the nourishing climate and deep, loamy soil in the wide, green valley of the Texas Colorado River - where Bastrop's "Lost Pine Forest" tips the air with freshness. But just as important as the sunshine, and right soil, is our constant care and management that coaxes our orchard to year-after-year of excellence. We don't simply grow pecans, we hand-pamper every crop to be the very best you can buy. At Pecan Grove Plantation it's a day-in-day-out labor of love - an 80 year tradition of quality! People say we grow the best pecans in Texas. But they can't seem to agree on which of our pecans are the best, our Extra-Fancy In-the-Shell, our Fancy Halves, or our Fancy Pecan Pieces. Why not try 'em all and decide for yourself! The 2017 crop of premium pecans will be available starting November 1st. Order one of the gift packages listed on the right using our order form. Simply click on the link, print the form, fill it out, and mail or fax it to us. Give us a call at 512-237-2844 or 1-800-311-1523. We'll be glad to help you! 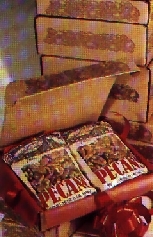 We offer our fine Papershell Pecans in old-fasioned burlap & gingham bags, chock-full in three popular sizes. Just right for the spirit of giving. And buy one for yourself too! Our meaty Pecan Halves add a tasty touch to you gift giving. They're just right for baking, roasting, or munching, when-ever you please. These Fancy Pecan Pieces measure up from the same top-quality crop as our Fancy Halves. They stay freezer-fresh & kitchen-ready to enrich and delight you favorite recipes..
Pecan Grove Plantation welcomes visitors October - December for over-the-counter sales and sightseeing of our scenic orchard. We're located six miles east of historic Bastrop (35 miles east of Austin) off of Texas 71.